" /> Chrysler Pacifica Novi MI | Szott M59 Chrysler Jeep " "
The minivan that kids and parents alike have been raving about has pulled up curbside at Szott M-59 Chrysler Jeep. That’s right, the 2017 Chrysler Pacifica is waiting right here to help you take on your fun-filled lives in Novi MI, come find yours today. Let’s talk. What is important to you as a parent? Do you need room enough for everyone? Is entertainment important to you? What about convenience and comfort? We know safety is important, but there is so much more to choosing a vehicle, and the 2017 Chrysler Pacifica fits all the criteria above for our Novi, MI customers. Let’s dive in and take a deeper look at Pacifica. Having kids means toting a lot of stuff. Sporting equipment, strollers, and luggage are common items parents have to haul around. The Chrysler Pacifica can accommodate almost anything you can toss inside. Stow and go seating allows for maximum storage when folded flat, while various configurations allow for other storage options and hidden storage compartments offer even more room! Add to that seating for up to 8, which offers up plenty of “not touching you” room, and the Stow n’ Vac to easily clean up those spilled Cheerios, and you have one convenient ride that will quickly become your new best friend. The 2017 Chrysler Pacifica offers the most advanced safety equipment for our customers in Novi, MI. Pacifica offers available safety features like 360 surround view camera, forward collision warning with active braking, parking assistance, rear cross path detection, LaneSense lane departure warning with lane keeping assist, blind spot monitoring system, and so much more. These superior systems were not only put in place to protect you in the event of a crash but to proactively prevent one from ever even occurring. Who’s got your back? There’s no doubt, Pacifica does. If it is technology you want, the 2017 Chrysler Pacifica delivers. Pacifica has something for everyone. For the kids, the available UConnect theater with dual 10.1-inch HD touchscreen with BluRay player, HDMI input, wireless headphones, Bluetooth remotes and downloadable games are sure to keep them at bay during long road trips. And for the parents? Well Siri Eyes Free, Sirius/XM Satellite Radio, navigation, and a variety of other features will keep you highly “infotained” with easy, hands-free access to all the tunes you want and the directions you need. Szott M-59 Chrysler Jeep is your destination for the Chrysler Pacifica and other Chrysler vehicles. We love the new Pacifica and all that it has to offer and we hope you will love it just as much as we do. Browse our broad selection of new Pacifica models online ahead of time, the come out for a test drive in your favorite so we can show you all the cool features inside and outside of this fun and comfy new minivan. We look forward to earning your business and welcoming your family into our own, so visit Szott M-59 Chrysler Jeep today and discover your new Chrysler Pacifica. Szott M59 Chrysler Jeep has the perfect new Chrysler model for you. Find it here, along with Novi’s best service and value. Get it all today. Buying a vehicle is a special experience. We understand that this isn’t something our customers do every day, which is why we treat every interaction with the respect that it deserves. Szott M59 has loyally served the Novi market for decades because we believe that the community and its people supersede any expectations set by a corporation. This is your community. This is our community. When you are shopping for a new or used car like a Jeep model, you expect the experience to match the promise, which is why we are open and transparent every step of the way. Below, you will find more information about the new Chrysler Pacifica. We hope that you’ll contact us and allow us the opportunity to show you why buying from the pros at Szott M59 Chrysler Jeep, is simply the best decision you can make. There’s more to a vehicle demonstration than picking out colors and taking a test drive. At Szott M59 Chrysler Jeep, we want you to know everything that’s important to YOU in your next new vehicle. 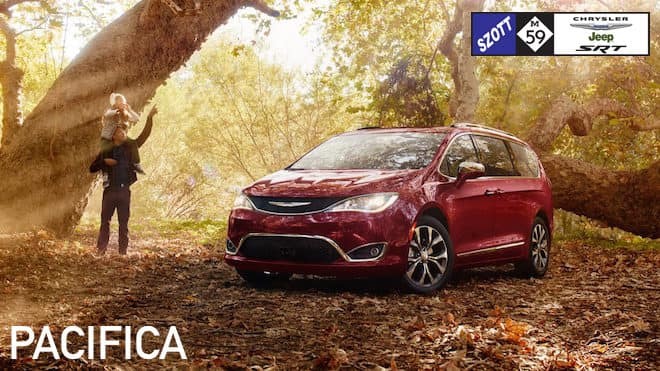 The new Chrysler Pacifica is uniquely positioned in the Novi market to satisfy the needs of practical fun lovers everywhere – the Pacifica has the proper mixture of reliable performance and sublime comfort that’s appealing to families in Novi. Our team is here to make sure you’re aware of every feature, tip, and maintenance best practice because we take pride in delivering the ultimate shopping experience for our customers. Watch this video to get your engine revving for your new Pacifica, and then let the pros at Szott M59 take care of the rest. We know you have many options when it comes to car dealers in the Novi area. Our hope is that you will give us the first opportunity to earn your business because of the tremendous experience, great pricing, exciting Chrysler selection, and our commitment to making your buying experience the most positive one you’ve ever had when shopping for a vehicle. We stand behind the ideal of delivering the type of respectful engagement that the people of Novi deserve. If you give us the first opportunity, you’ll see why our customers come back time and time again.